Set the scene with an LED light that does a lot more than just glow. This smart votive is controlled through an app, which lets you choose colors (from an endless array), adjust brightness, and set effects—like flashing, fading, and pulsing—all from your device. 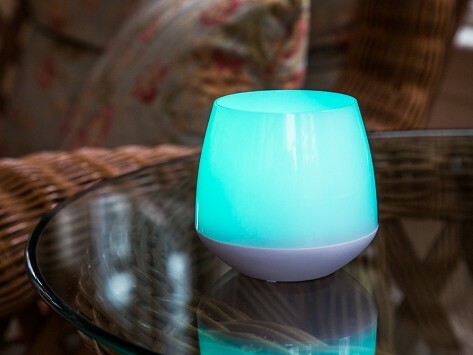 You can even synch multiple lights as a group, set the timer and use it as a nightlight, or flip it over to hold a traditional tea light while it glows. Dimensions: 3.5" x 3.3" x 3.3"
I just love this, it makes a nice night light, when you are just relaxing in a tub. I love it that you can control it by the touch of your phone. The lights (we have two of them) work fine and we are looking forward to trying them out at our next party. Neither my iPhone6s nor my wife's iPhone 6 can control these. When the phones connect the candle crashes. My iPad Air 2, though, does fine so that's what I use. I did contact the manufacturer and they are very nice with quick responses to my emails. They did offer to replace the candles or I could just return them but I like them and I strongly suspect any replacement would do the same. Both of my candles act the exact same way. So I am keeping them. Not sure these are worth the money but ai'm keeping them regardless. 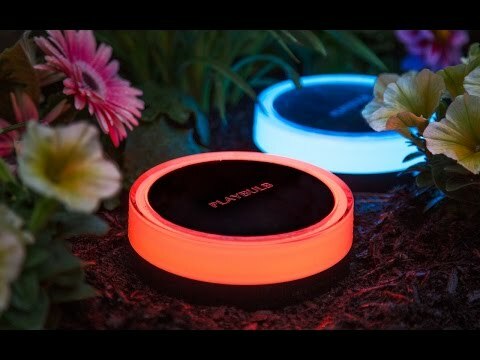 PLAYBULB's solar powered garden lights and flameless candles shine in your choice of colors and effects. And you control it all through an app. Illuminate your house or yard in any color—even use an eyedropper to select one from a photo. Create effects like pulse, flash, and fade. You can even sync multiple lights as a group. The solar powered LED garden light is water-resistant and stakes into your lawn or planters. Or line a walkway with multiple lights and set them to turn on automatically when the sun goes down. And the smart votives can mimic a flickering flame. Create a soft glow for tabletop lighting or set the timer and use it as a nightlight. Give your home a serious boost of colorful light, with just a touch of the app.